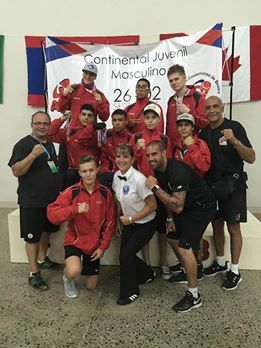 After five intense days of competition regrouping 57 boxers from 11 countries, the Youth Continental Championships came to an end on Saturday evening and what a great week it was for our Canadian team! 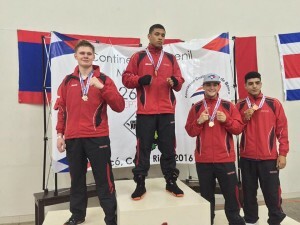 Bringing home four medals, our young boxers can be proud of their performances. This Championship was the first International competition for most of our boxers and it allowed them to measure up against different style of boxing. Although many bouts finished with TKO, the bouts were a great experience for our Canadian representatives, which will help them prepare for future competitions. ” The biggest difference we have observe is the experience. Indeed, we had a few difficulties standing out among other teams in the ring, but our young boxers had a great experience and learned a lot in the ring and while watching boxers from other countries. Our team comprises disciplined and passionate individuals who were interested in every opportunity presented to them throughout the week. They gave their all in the ring and they can come back to Canada without regret. They are our future Olympians and they demonstrated their interest to reach this level in a near future. ” mentions Benoit Gaudet, National team coach. Although some boxers didn’t reach the medals, the Canadian team still maximized their training while in Costa Rica by organizing a sparring session with the local boxers. The extra-time in the ring definitely helped them work on their skills. To take a look at all the information from the competition, you may visit the EVENT PAGE. The next competition on the calendar for our Youth National team is the Youth World Championships that will take place November 14th-27th in St-Petersburgh, Russia. The selected boxers for this championships will be announcing closer to the tournament date.